WASHINGTON, D.C. (WPVI) -- The White House and Republican leaders worked Thursday to wring votes out of resistant moderate GOP lawmakers for the House health care bill, but remained shy of the support they'd need to fully rouse the measure back to life. Centrist Republicans were the primary target of the lobbying, a day after the conservative House Freedom Caucus announced its support for a revised version of the legislation. The fresh backing from the caucus brought the bill back from the legislative graveyard, however, leaders need moderates. And so far, they have resisted the effort to jump aboard. White House officials and party leaders were eager for a vote this week if possible, before the 100th day of Donald Trump's presidency, which falls this Saturday. But Speaker Paul Ryan, R-Wis., wants to avoid an encore of last month's embarrassment, when he abruptly canceled a vote on a health care overhaul because of opposition from moderates and conservatives alike. Ryan told reporters that leaders were making progress but added, "We're going to go when we have the votes." He noted that he had spoken earlier this year about a 200-day legislative plan because of the complexity of revamping the nation's health system, its tax code and border security. In at least one instance, Trump and Vice President Mike Pence spoke to one reluctant conservative who is now a yes vote. Rep. Mo Brooks, R-Ala., said he'd already decided to switch to backing the revamped bill on Wednesday before he got two phone calls from Pence, who on the second call handed the phone to Trump. "Donald Trump expressed his appreciation for the position I was taking," Brooks said Thursday. "That gives you a good feeling inside about what you're doing." The new version would allow states to let insurers charge those with pre-existing conditions higher rates than healthy subscribers. That was banned under the Affordable Care Act. States could also let insurers opt out of requirements that they cover a list of services like maternity care..
Insurers would also be able to charge older customers higher rates than younger ones. Overall, the legislation would cut the Medicaid program for the poor, eliminate Obama's fines for people who don't buy insurance and provide generally skimpier subsidies. Democrats remained solidly against the legislation, which they said would make health care coverage less available and costlier. House Minority Leader Nancy Pelosi, D-Calif., told reporters that for Republicans, voting for the bill "is going to be doo-doo stuck to their shoe for a long time." Conservatives embraced the revisions as a way to lower people's health care expenses. Moderates saw them as diminishing coverage because insurers could make policies for their most ill - and expensive - customers too costly for them to afford. "No bill is going to solve every issue," said Rep. Tom MacArthur, R-N.J., who crafted the newest edition of the legislation with Rep. Mark Meadows, R-N.C., who heads the hard-line Freedom Caucus. MacArthur is a leader of the roughly 50-member moderate House Tuesday Group, but it is unclear that he has won over many of their votes and he conceded that some lawmakers "are struggling to get to yes." 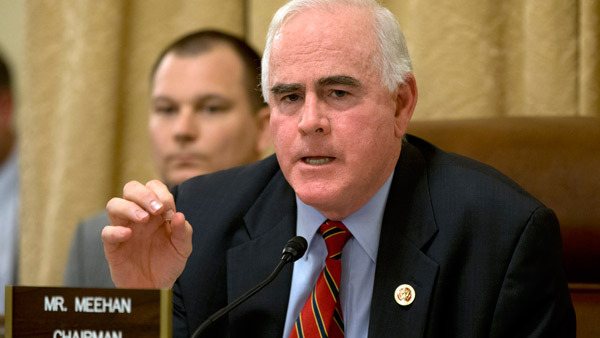 Two moderate Pennsylvania Republicans affirmed Thursday they would vote no - Reps. Patrick Meehan, who'd been publicly undeclared, and Ryan Costello, who'd said he'd have opposed the original bill. Both cited fears that the new bill would leave people with serious illnesses unprotected. Meehan said he was called recently by Pence and lobbied "by everyone in leadership." The American Medical Association said it opposed the newly reshaped bill, as it did the original legislation. The doctors' group said letting insurers boost premiums on people with pre-existing conditions "will likely lead to patients losing their coverage." Some lawmakers and GOP aides suggested leaders were less than 10 away from the 216 votes Republicans will need to prevail. Others were more cautious, and there was little overt indication of new support from party moderates. "I still think there's a lot of work to be done" before a vote can be held, said Rep. Steve Stivers, R-Ohio, part of the House GOP leadership.